This is one from my archive. 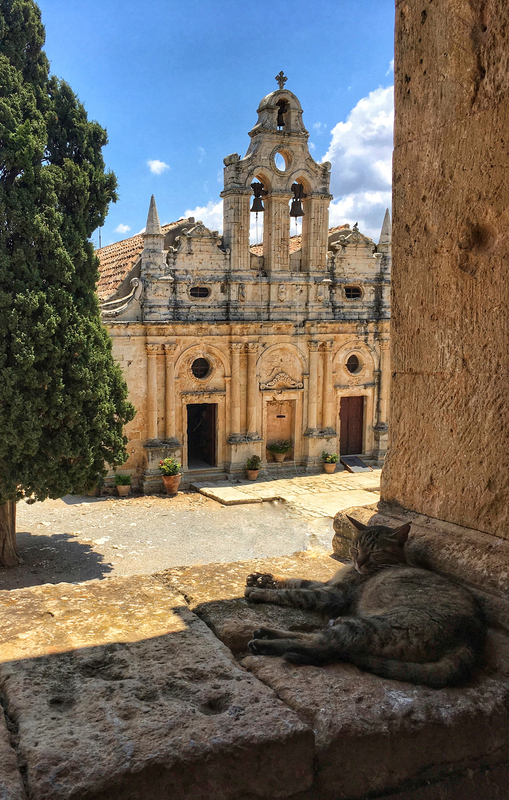 Last summer one one of our forays to Crete we visited the Arkadi Monastery. The Monastery lies in the west of the island, southeast of the coastal town of Rethymnon. It reached its heyday in the 16th century when the current catholicon (cathedral or main church) was built. At one time, the monastery was noted as a place for arts and scientific knowledge with a school and a rich library. It is a fortified Monastary. The triple aisled catholicon sits in the middle of the central courtyard. It’s baroque façade with double doors is balanced by a fake door between. Hanging above this is a rudimentary and rusty iron bell. Around the central church are monk’s cells and other offices of the monastery, built along the fortification wall. 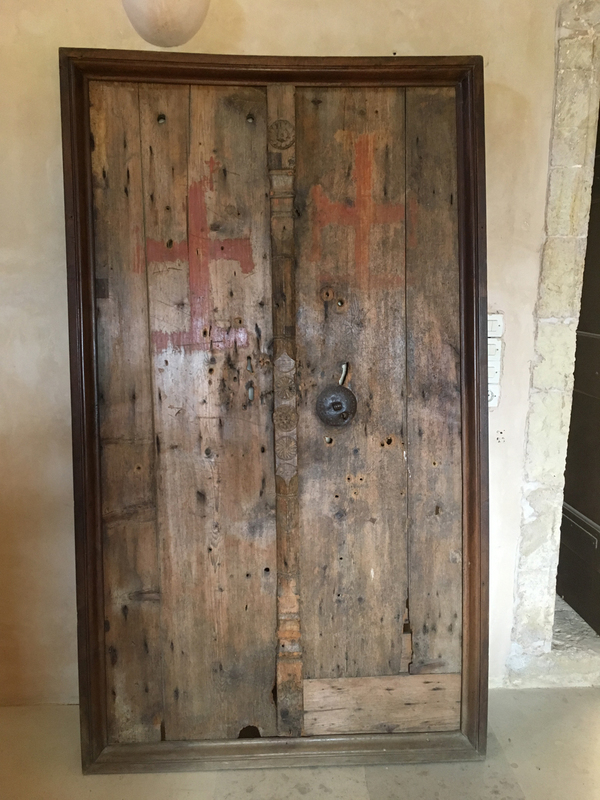 The monks’ cells are plain with simple doors, often ornamented with a cross. 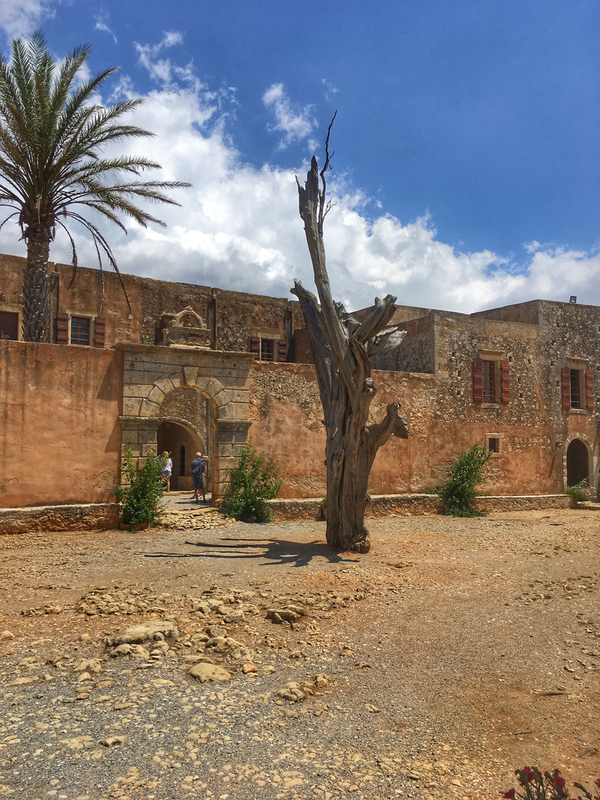 The monastery, despite its Baroque splendour, is significant for its role in the Cretan revolt of 1866 against Ottoman rule. During the conflict, 900+ Greeks, over half of them women and children, sought refuge here. However, on November 1866, the Ottoman’s laid siege to the monastery, ultimately breaching the walls. The majority of of people taking refuge were killed – most of the women and children in the gunpowder store where they had been hiding. In the middle of the courtyard stands a dead tree preserved from that time. 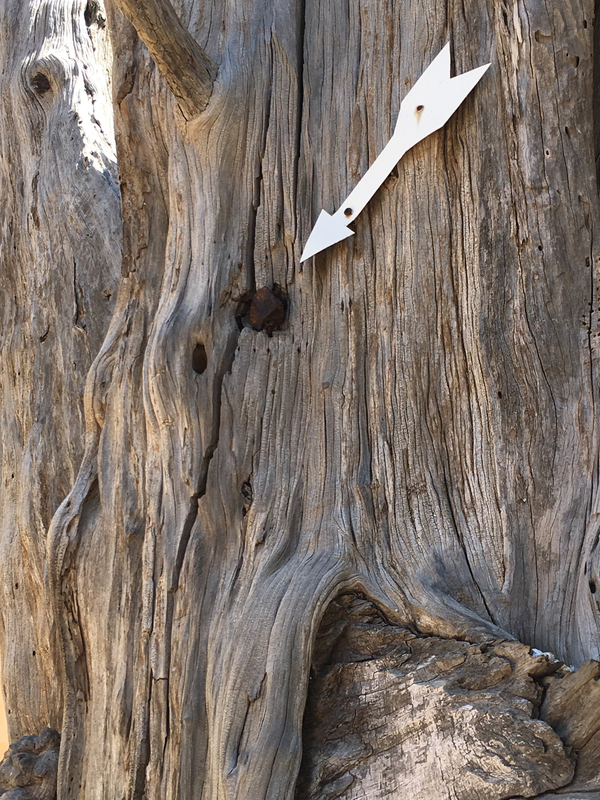 It still has shrapnel embedded, helpfully pointed out with an arrow. The tree stands at the entrance to the Refectory courtyard. The Refectory, originally constructed in 1687 was the place where fighters made their last stand against the Ottoman forces. Inside, the old door is still preserved, complete with bits of metal and burning, a testament to the violence. 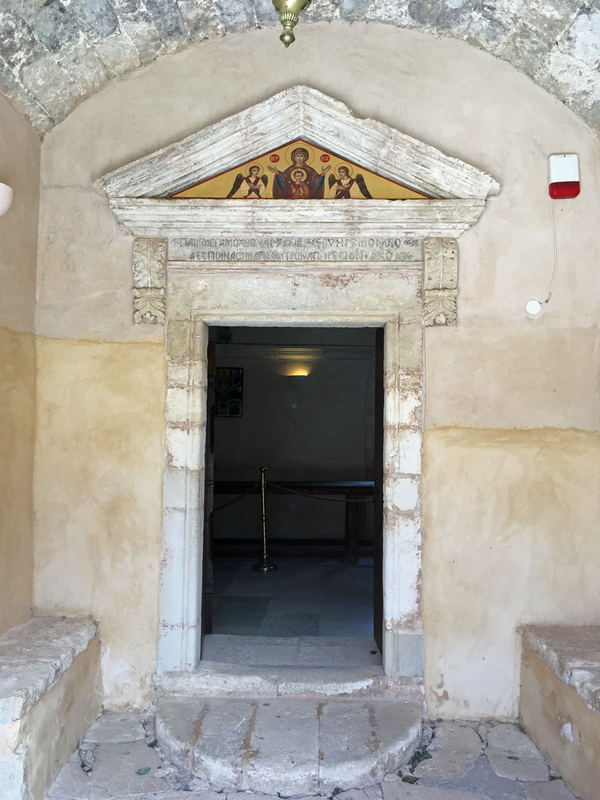 As you exit the adjacent room with its new doors there is a view of the double apses of the catholicon. Today it is a peaceful place, but still a reminder of events in more recent history of the island. 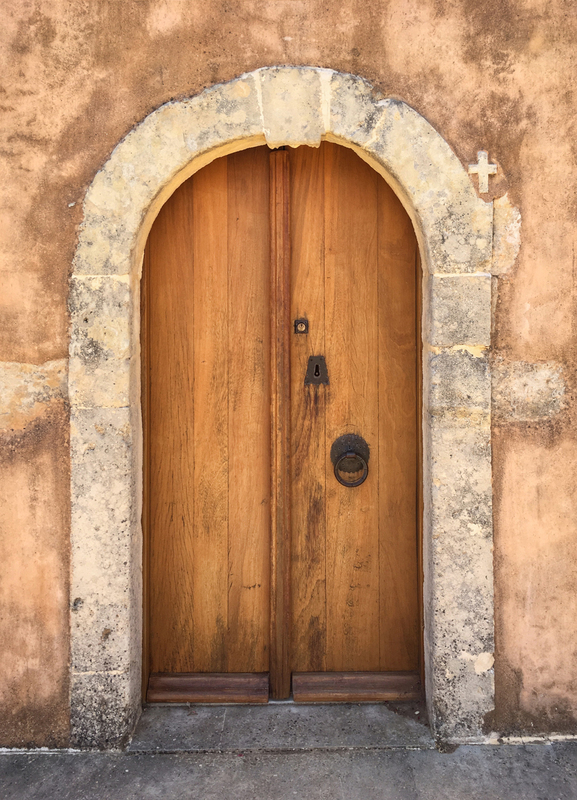 Check out Norm’s Thursday Doors for more 2018 recaps of fascinating buildings and their doors. All that wonderful history Deb. Those doors are a symbol of some amazing stories. Great photos. 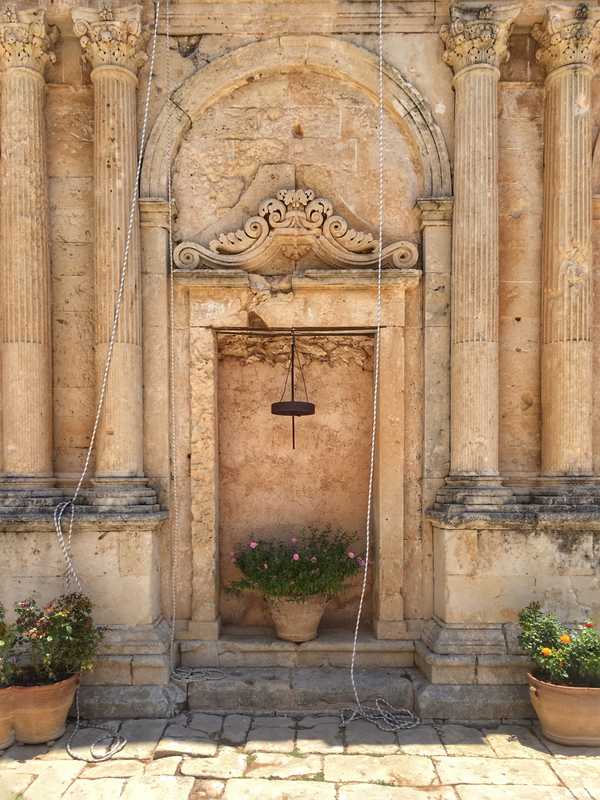 As soon as I saw the original Arkadi refectory door preserved, a door post began forming in my head. A great place to visit. 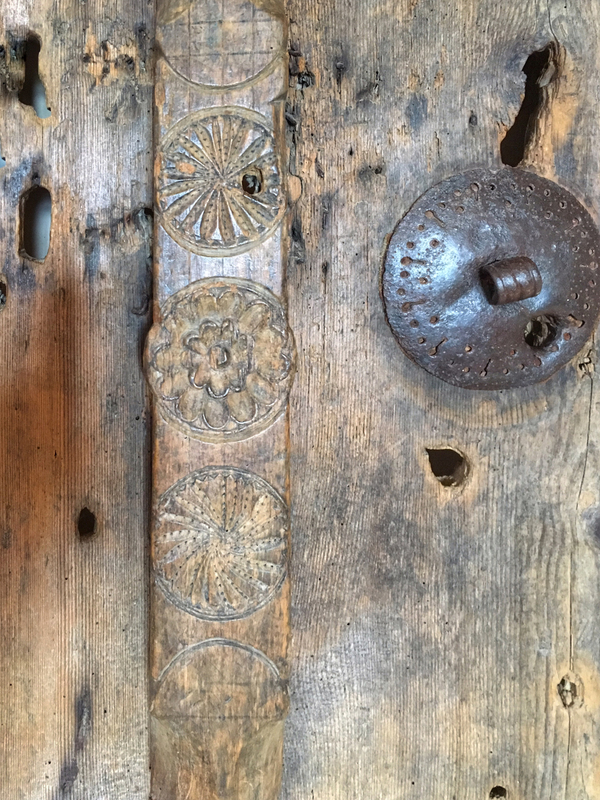 A clever use of this monastery’s doors to illustrate its fascinating history. Great post. Thanks for the tour. The last photo is a special kind of beauty. Thanks. 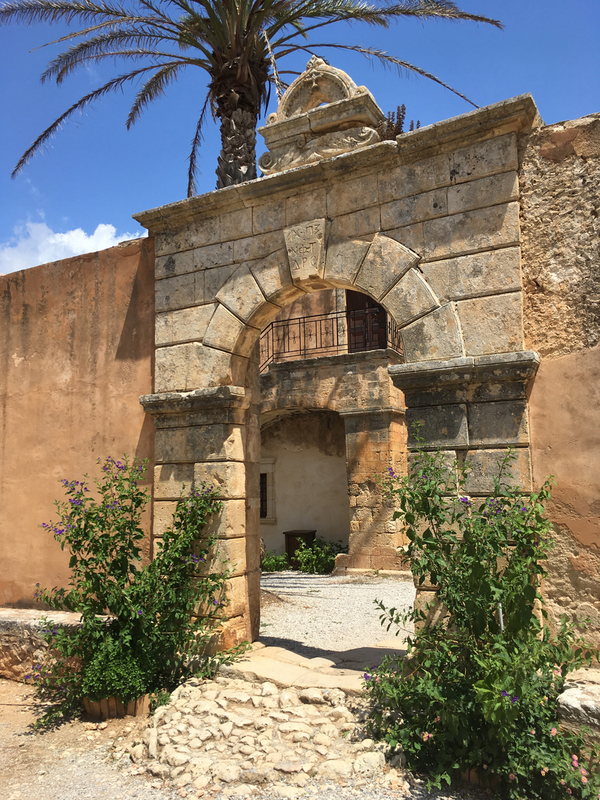 I hope you enjoyed the doors of Arkadi. It is a fascinating place. 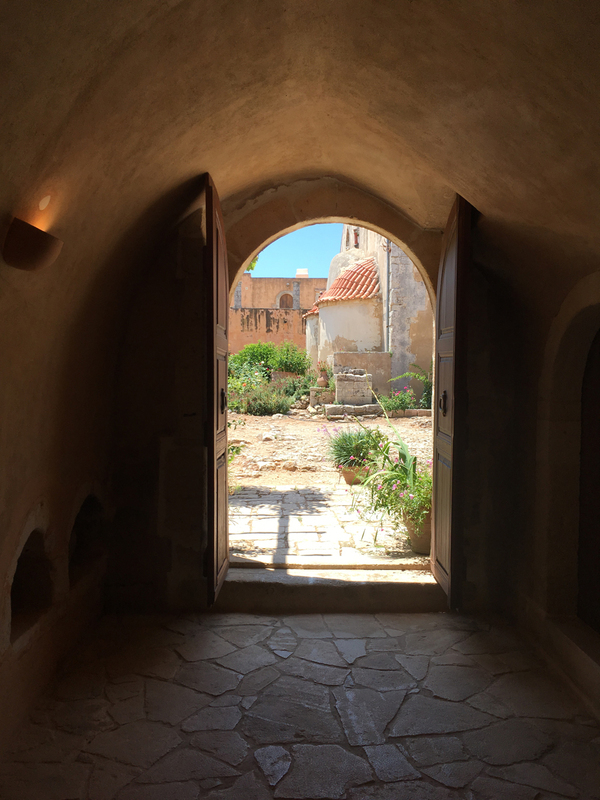 The first year I moved to Crete I went to see Arkadi Monastery .The day was warm and very quiet and peaceful .It was hard to believe so much tragedy had happened there. I wrote about it in my book published some6 years ago. Thank you for these wonderful photo’s of the Monastery which is a beautiful place to visit. This is a place I visited some years ago and was astounded to learn of the tragedy carried out there. Thanks for re-blogging, Rita. It is a special place. I find it hard to keep track of all the periods of insurrection there were in Crete during the last half of the 19th century. This place is fascinating. I love that first shot with the cat in the foreground luxuriating in the shade. 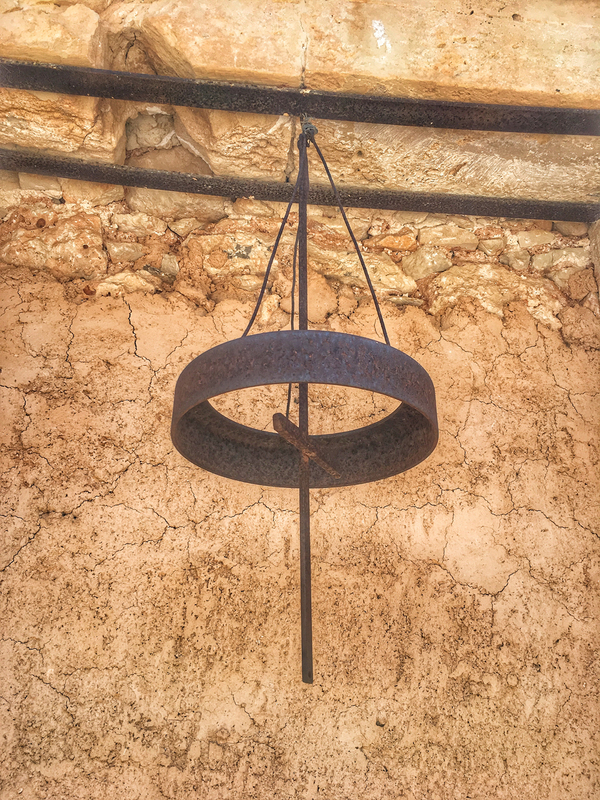 As much as I enjoyed the doors and these old buildings, the thing that really caught my eye was the rudimentary bell. Not pretty but I’m sure it was quite effective. Thanks Norm. I loved the cat, too. I had to wait forever for a group of tourists to move out if view. Luckily, the cat was just as patient! The bells are quite common and I’m sure they have a specific name which I haven’t yet been able to find. I thoroughly enjoyed the visit to this lovely spot. Thanks! I really like the fake door with the floors in front of it and the door details you showed later. 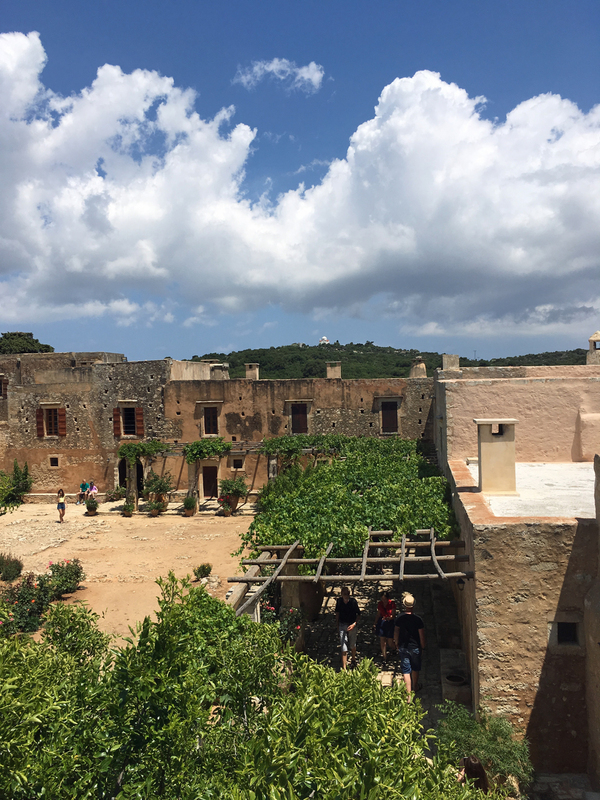 Arkadi Monastery is a very special place. I enjoyed photographing the doors – fake or otherwise! I had to put on my glasses to get a really good look at that cat. Loads of history here and so really old doors. Nice post.